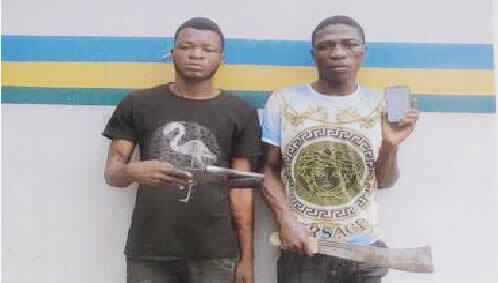 The police have arrested two suspected members of an armed robbery gang that terrorises Lekki, Lagos. Maroko Divisional Police Officer (DPO),CSP Isah Abdulmajid and his men arrested Adebayo Ayomide and Isaac David shortly after they allegedly robbed two women of their phones. In a statement yesterday, Lagos Command spokesman Bala Elkana, a Deputy Superintendent (DSP), said the suspects were apprehended on March 9 around 9pm. He said the DPO and his men were patrolling the Lekki-Ikoyi Link Bridge when they ran into the two seemingly panicky young women, Gbemi and Hannah. “Upon questioning them, they told the team that they had just been dispossessed of their phones by the suspects at gunpoint. They pointed at the direction through which the hoodlums escaped on a motorcycle and the police gave them a hot chase. “The team tracked down the suspects and upon searching them, their operational single-barrel gun, a cutlass and the phones were found on them. The items were recovered and the criminals taken into custody. “In their statements, they owned up to belonging to a syndicate terrorising Lekki and its environs. “Commending the team for swiftly responding to the crime and arresting the suspects, Police Commissioner Zubairu Muazu directed that the case be transferred to the Special Anti-Robbery Squad (SARS) for further investigation.